There are conflicting theories as to the origins of the Dukes of Normandy. 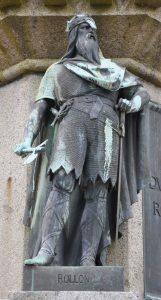 But the point on which most modern historians agree is that they descend from the Earls of Orkney and that their founding father was Rollo, son of Ragnvald Øysteinsson, the first Earl. 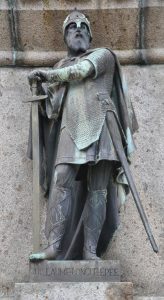 According to the Heimskringla, Rollo was a great Viking, raiding on both sides of the North Sea. However, one summer he chose to “make a cattle foray” on the Norwegian county of Viken, where it was expressly forbidden by the king. 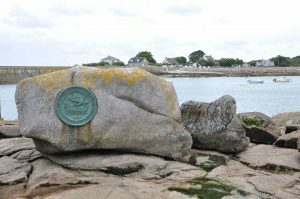 This resulted in his banishment from the country of his origins and accounts for his romanticised wanderings as far as the Hebrides and the Ilse of Man and later to what is now Normandy. 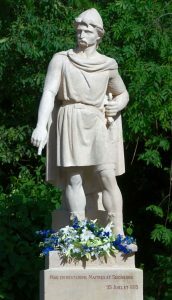 A more prosaic version seems more likely, that he joined a band of Viking raiders and eventually “subdued for himself a great earldom, which he peopled with Northmen”. 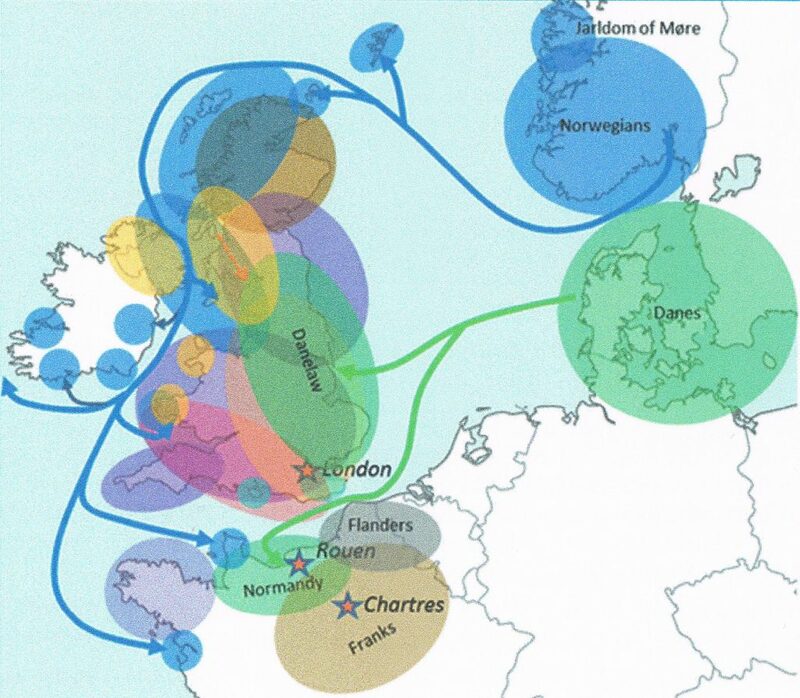 A rival version claims that the Dukes of Normandy were of purely Danish stock and unrelated to the Earls of Orkney. 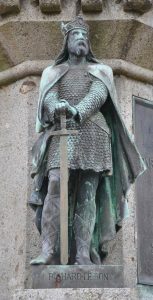 According to the 10th century History of the Normans, a king of Denmark was antagonistic to Rollo’s family, and following the death of his father, his brother was killed and Rollo was expelled from Denmark. 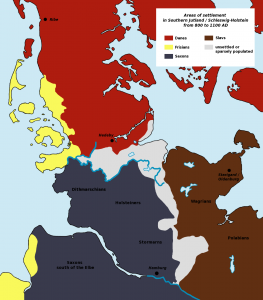 Yet another maintains that the family was a combination of Danish and Norwegian, the founding father being Thebotan, Duke of Schleswig and Stormarn. 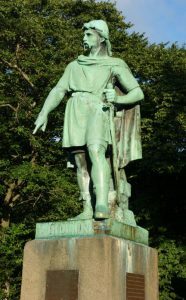 He fled to Norway to escape Danish tyranny in the early 8th century, settling there and taking his two wives from the Norwegian ruling class. 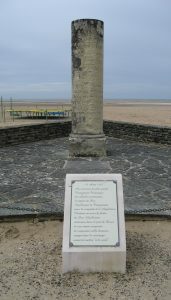 That Rollo was a Scandinavian is not in dispute, but as Saxons inhabited most of the territory of this alleged ancestor at the time of his flight, Thebotan might turn out to have been an ethnic German! 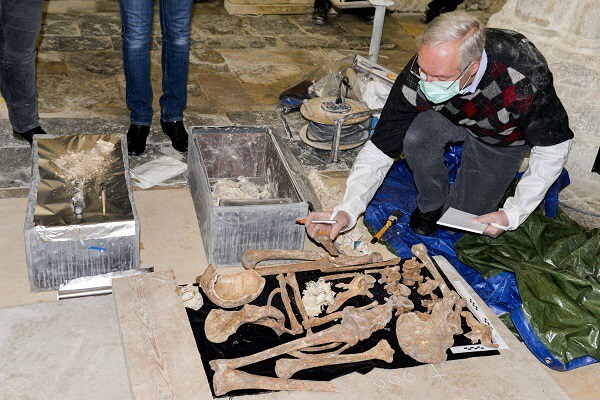 *DNA testing carried out in 2016 has not resolved the matter, as the bodies contained in the graves of Richard I and Richard II date from the pre-Viking era. 1. 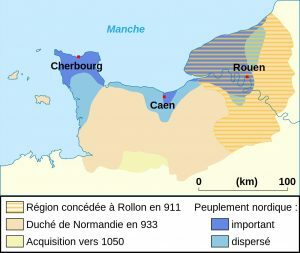 Rollo of NORMANDY born c860 and died c932 Rouen, Normandy, married 1st Poppa de BAYEUX born c882 Bayeux, Normandy, died c932, married 2nd Giselle de FRANCE (daughter of Charles III de FRANCE and Frederuna of SAXONY). 1.1. William I of NORMANDY “William Longsword”, born c893 Normandy, died 22 December 942 Picquigny, Flanders, had a child by Sprota UNKNOWN, married Luitgarde de VERMANDOIS (daughter of Herbert II de VERMANDOIS and Adèle de FRANCE). 1.2. 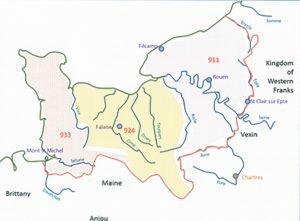 Adèle of NORMANDY married 935 Guillaume III of AQUITAINE. 1.1.1. Richard I of NORMANDY “Richard the Fearless” born 2 September 933 Fécamp, Normandy, died 25 November 996 Fécamp, Normandy, married 1st 960 Emma of FRANCE (daughter of Hugh de FRANCE and Hedwig of SAXONY) born 943, died 24 March 968, married 2nd Gunnor UNKNOWN born c936. 1.2.1. 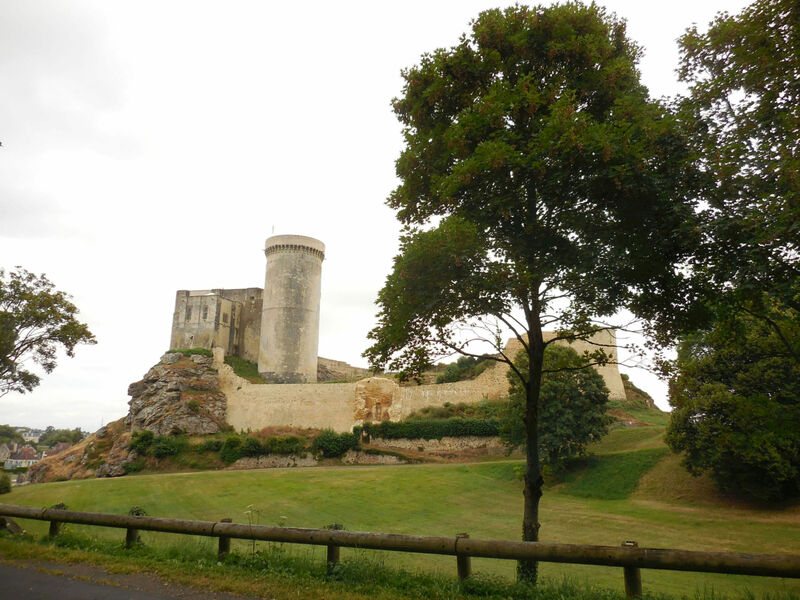 Adèle d’AQUITAINE married Hugh de FRANCE (son of Hugh de FRANCE and Hedwig) born c941, died 29 October 996. 1.1.1.1. Richard II of NORMANDY “Richard the Good”, born 28 August 963, died 3 September 1026, married 1st c1000 Judith de BRETAGNE (daughter of Conan I de BRETAGNE and Ermengarde d’ANJOU) born 982, died 1017, married 2nd after 1017 Papia of d’ENVERMEU (daughter of Richeldis d’ENVERMEU). 1.1.1.2. 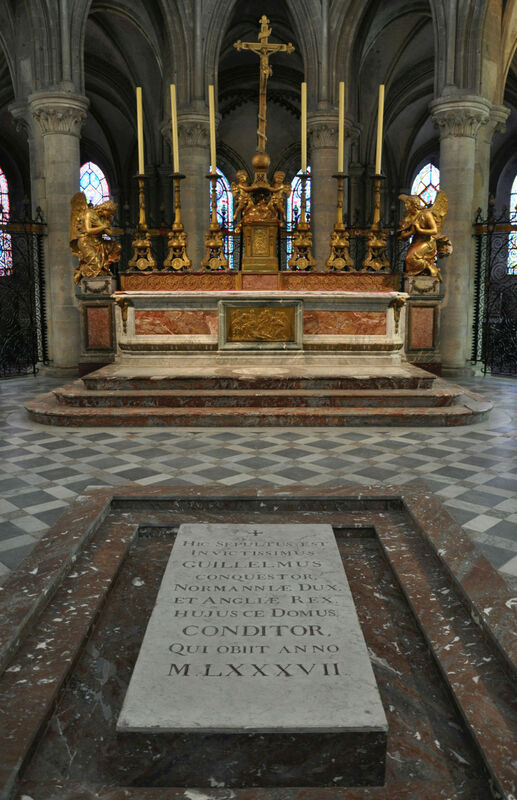 Robert of NORMANDY Archbishop of Rouen, died 1037. 1.1.1.2. 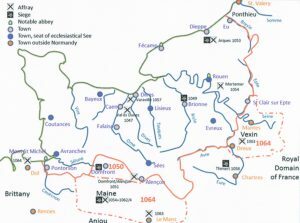 Emma of NORMANDY born c985 Normandy, married 1st 1002 Aethelred II of ENGLAND, married 2nd Cnut of DENMARK King of England, Denmark and Norway (son of Sweyn of DENMARK) born c995 Denmark, died 18 November 1035 Shaftesbury, Dorset, England. 1.1.1.3. 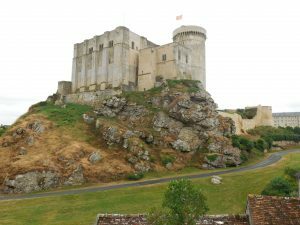 Hawise of NORMANDY married Geoffrey de BRETAGNE (son of Conan I de BRETAGNE and Ermengarde d’ANJOU) born 980, died 26 November 1008. 1.2.1.1. 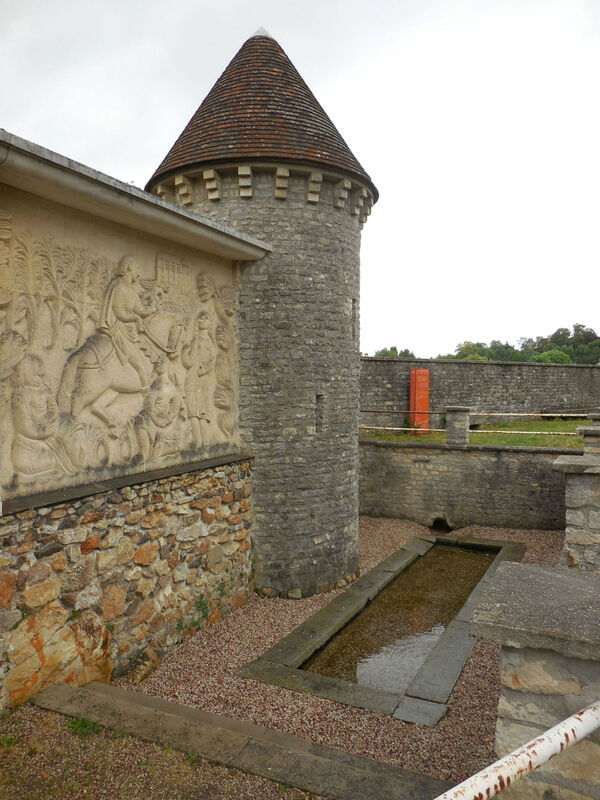 Robert II de FRANCE born c972, died 26 July 1031, married 1st Rozala of LOMBARDY born c955, married 2nd Constance d’ARLES. 1.1.1.1.1. 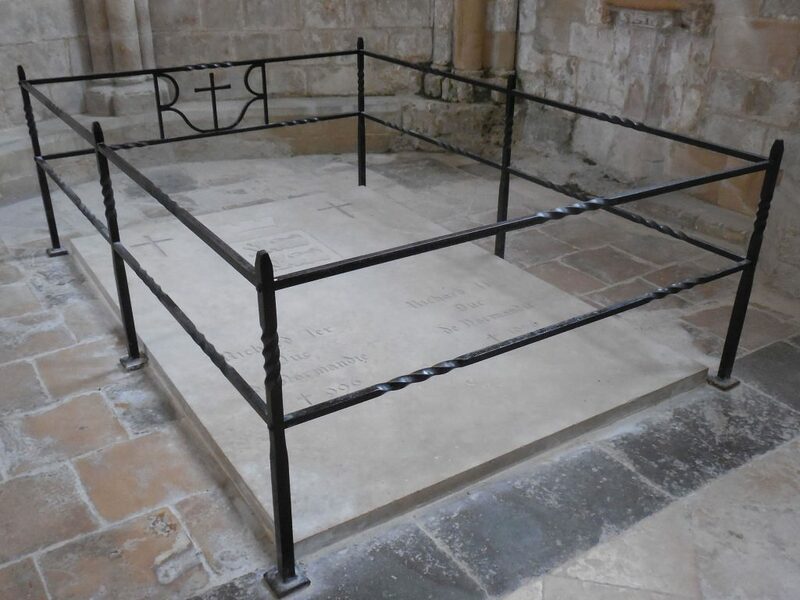 Richard III of NORMANDY born c1003, died 1027. 1.1.1.1.2. Alice of NORMANDY born c1003, died 1038, married Renaud de BOURGOGNE. 1.1.1.1.3. 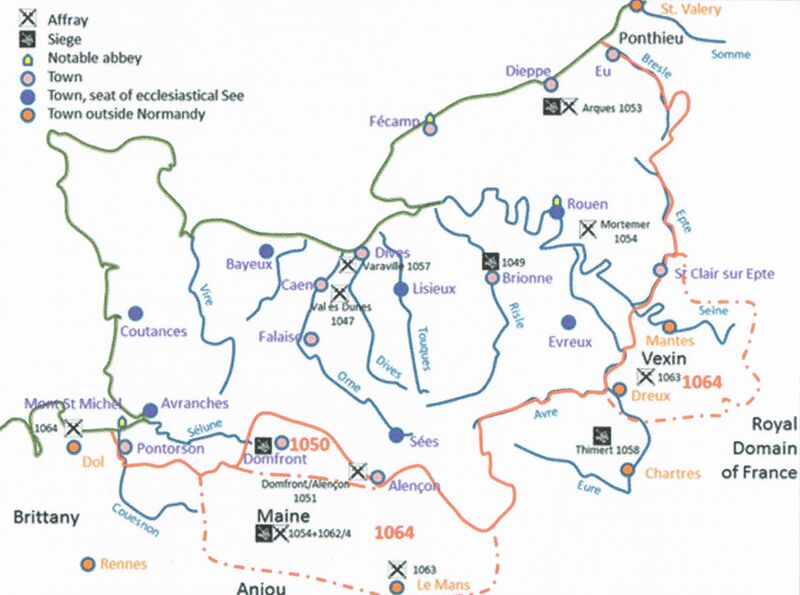 Robert I of NORMANDY born c1005, died July 1035 Nicaea, Turkey, buried Nicaea, Turkey and later Apulia, Italy, had children by Herleva (daughter of Fulbert and Doda) born c1003 Falaise, Normandy, died c1050. 1.1.1.1.4. Guillaume of NORMANDY monk, born c1008, died 1025 Fécamp, Normandy. 1.1.1.1.5. Eleanor of NORMANDY born c1012, married Baldwin IV of FLANDERS (son of Arnulf II of FLANDERS and Rozala of LOMBARDY) born 980, died 5 June 1035. 1.1.1.1.6. 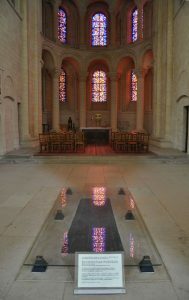 Matilda of NORMANDY nun, born c1014, died 1033. 1.1.1.1.7. 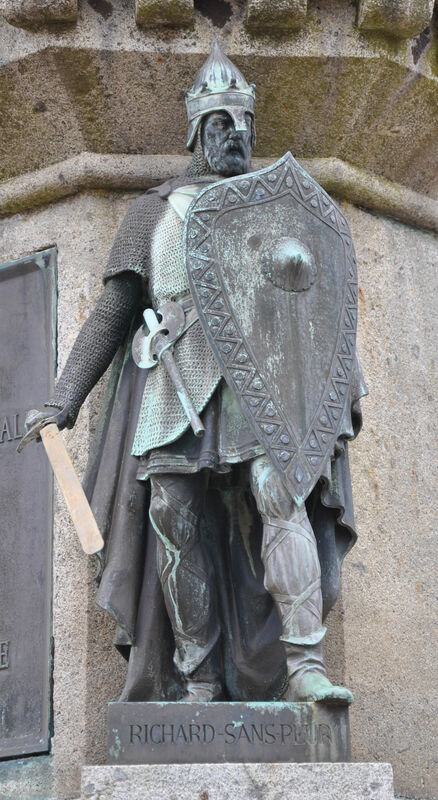 Mauger of NORMANDY Archbishop of Rouen, born c1019, died c1055. 1.1.1.1.8. Guillaume of NORMANDY Count of Talou, Count of Arques, born before 1026, died after 1054, married Unknown de PONTHIEU (daughter of Hugues II de PONTHIEU and Berthe d’AUMALE). 1.1.1.2.1. Edward of ENGLAND “Edward the Confessor” born 1003, died 11 January 1066 London, England, married Edith of WESSEX (daughter of Godwin of WESSEX and Githa TORGILSDATTER) born 1025. 1.1.1.2.2. 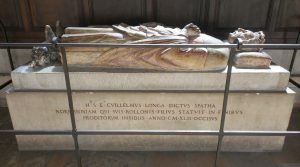 Harthacnut of DENMARK King of England, born c1018, died 14 June 1042. 1.2.1.1.1. Henri I de FRANCE born 10 May 1008, died 10 August 1060. 1.2.1.1.2. 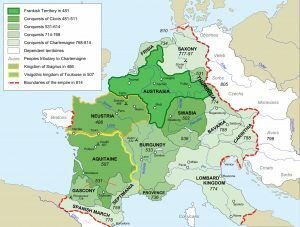 Adèle de FRANCE born 1009, died 14 January 1079 married Baldwin V of FLANDERS (son of Baldwin IV of FLANDERS and Ogive of LUXEMBOURG) born 25 August 1012 Arras, Flanders, died 7 September 1067 Lille, Flanders. 1.2.1.1.3. 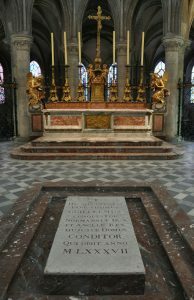 Robert de FRANCE Duke of Burgundy. 1.1.1.1.3.1. 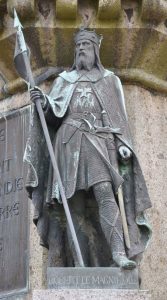 William II of NORMANDY, William I of ENGLAND born c1028 Falaise, Normandy, died 15 September 1087 Rouen, Normandy, buried Caen, Normandy, married c1055 Maltida of FLANDERS (daughter of Baldwin V of FLANDERS and Adèle de FRANCE) born c1031, died 8 November 1031. 1.1.1.1.3.2. 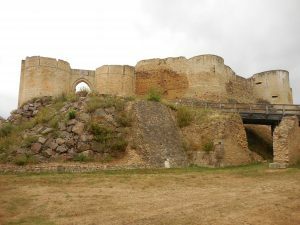 Adelaide of NORMANDY born c1030, died c1083, married 1st before 1049 Enguerrand II (son of Hugh II de PONTHIEU and Berthe d’AUMALE) died 1053, married 2nd c1053 Lambert II de LENS (son of Eustace I de BOULOGNE and Maud de LEUVEN) died 1054 Lille, Flanders, married 3rd Odo de CHAMPAGNE (son of Stephen II de TROYES and Adele de TROYES) born c1040, died 1115. 1.1.1.1.5.1. Judith of FLANDERS born c1033, married Tostig of WESSEX (son of Godwin of WESSEX and Githa TORGILSDATTER) born c1026, died 1 October 1066 Stamford Bridge, East Riding of Yorkshire, England. 1.2.1.1.2.1. 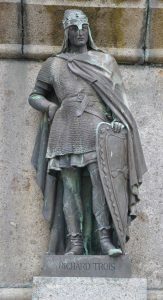 Baldwin VI of FLANDERS born c1030, died Jul. 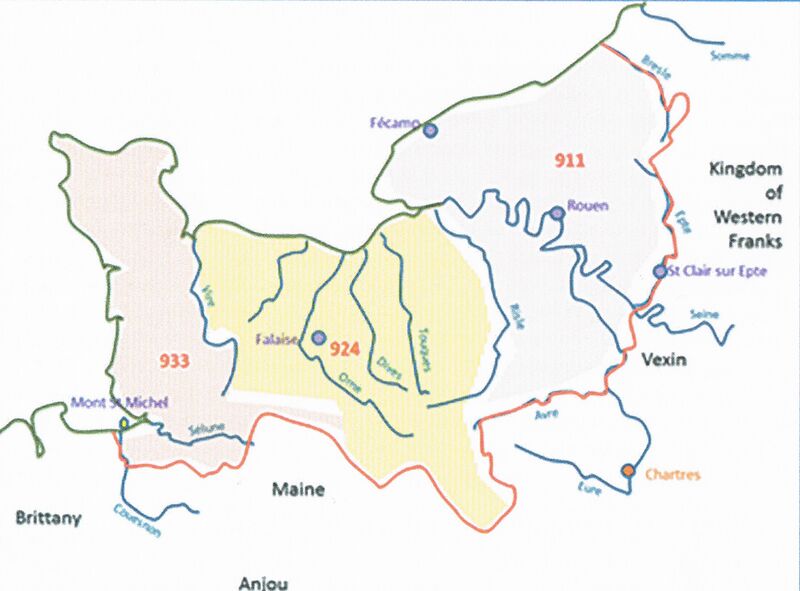 23, 1070, married Richilde de MONS. 1.2.1.1.2.2. 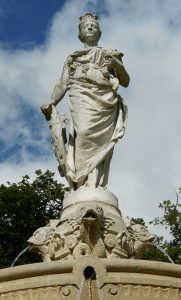 Maltida of FLANDERS (see 1.1.1.1.3.1. 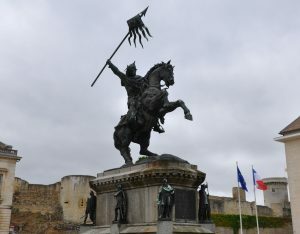 William II of NORMANDY, William I of ENGLAND above). 1.2.1.1.2.3. 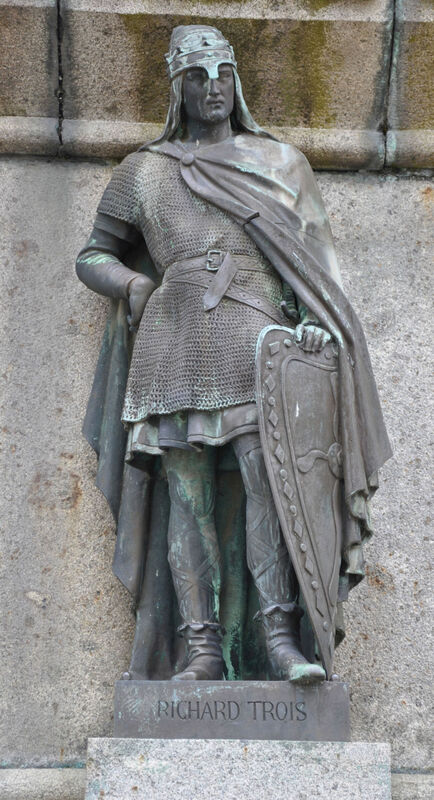 Robert I of FLANDERS born c1035, died 19 October 1093. 1.1.1.1.3.1.1. 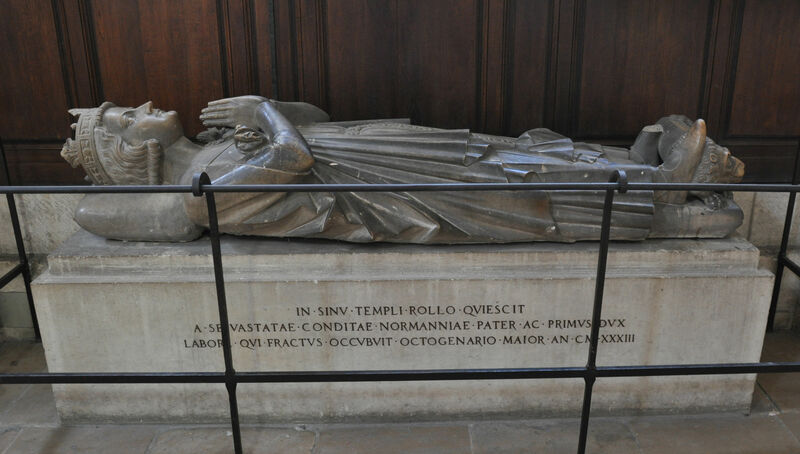 Robert II of NORMANDY “Robert Curthose” born c1051 Normandy, died 1134 Cardiff, Wales, married Sybilla di CONVERSANO (daughter of Count Goeffrey di CONVERSANO). 1.1.1.1.3.1.2. William II of ENGLAND “William Rufus”, born c1056 Normandy, died 2 August 1100, New Forest, Hampshire, England, unmarried. 1.1.1.1.3.1.3. 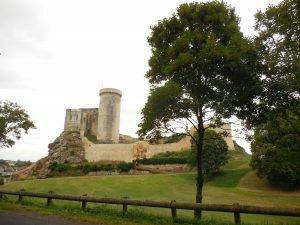 Adela of NORMANDY born c1067 Normandy, died 1137, France, married Stephen de BLOIS (son of Count Theobald de BLOIS and Garsinde du MAINE) born vers 1045, died 1102 on crusade. 1.1.1.1.3.1.4. Henry I of ENGLAND “Henry Beauclerc”, born c1086 Selby?, East Riding, England, died 1 December 1135, Normandy, married 1st Matilda of SCOTLAND (daughter of Malcolm III of SCOTLAND and Margaret of ENGLAND), married 2nd Adeliza de LOUVAIN (daughter of Count Godefroi de LOUVAIN) born c1103, died 23 April 1151. 1.1.1.1.3.2.1. 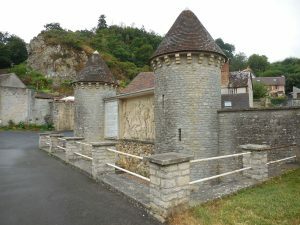 Stephen d’AUMALE born c1079 in Aumale, Normandy, died in 1127, married Hawise of MORTIMER (daughter of Ralph of MORTIMER and Mélisende UNKNOWN). 1.1.1.1.3.1.1.1. 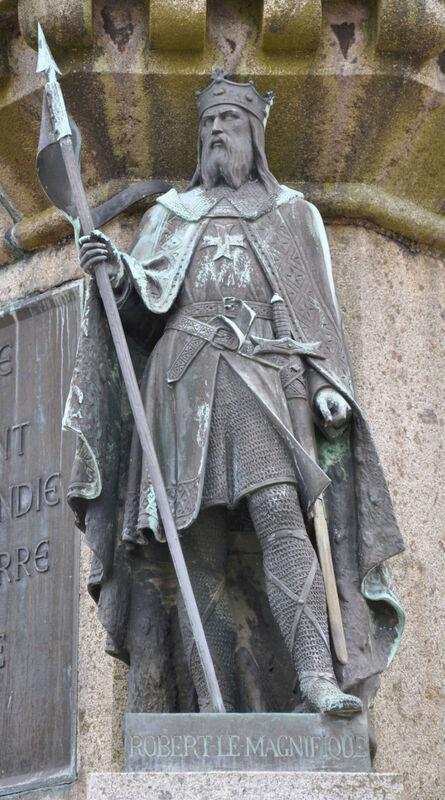 William of NORMANDY Count of Flanders, born 1102 Rouen, Normandy, died 1128, St. Omer, Flanders. 1.1.1.1.3.1.3.1. 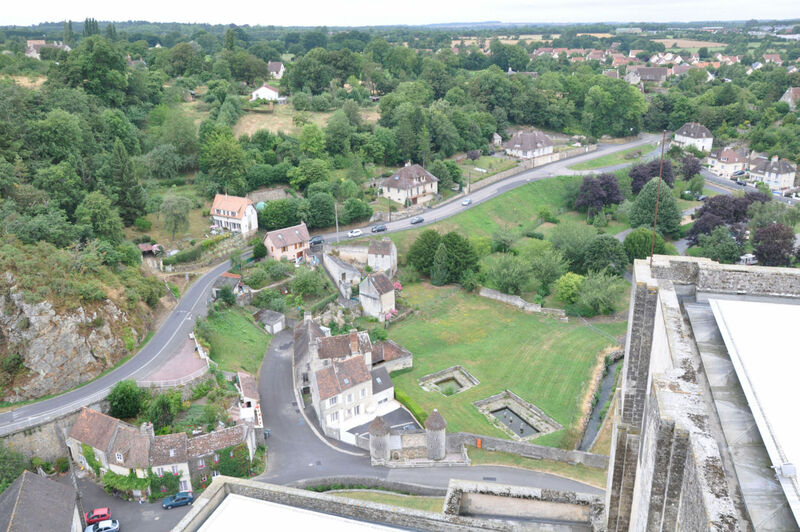 Stephen de BLOIS, King Stephen of ENGLAND born c1094, Blois, France, died 1154 Dover, Kent, England. 1.1.1.1.3.1.4.1. 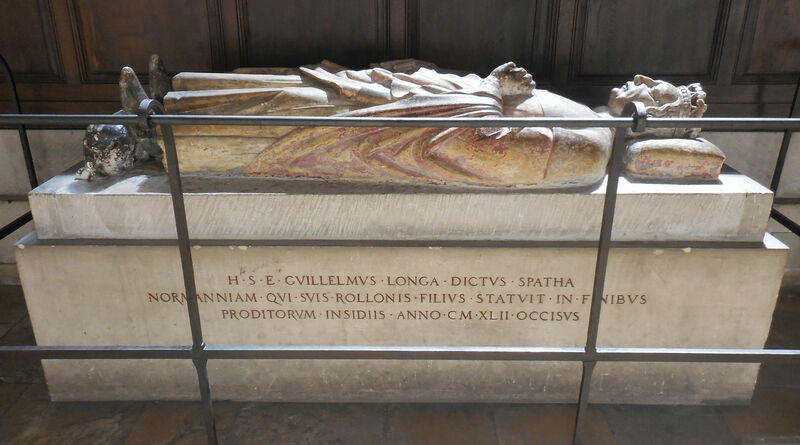 Matilda of ENGLAND born c1102, died 10 September 1167 Rouen, Normandy, married 1st 1114 King Henry V of GERMANY, Holy Roman Emperor, married 2nd Count Geoffrey V of ANJOU. 1.1.1.1.3.1.4.2. 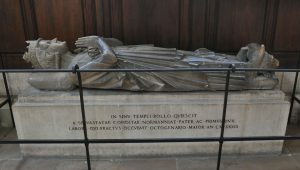 William of ENGLAND born 12 November 1103 Winchester, Hampshire, England, died 2 December 1120 at sea in the White Ship disaster. 1.1.1.1.3.2.1.1. William d’AUMALE born on 27 August 1127, died 27 August 1179, married Cicely FITZDUNCAN (daughter of William FITZDUNCAN and Alice de RUMILLY). 1.1.1.1.3.2.1.2. 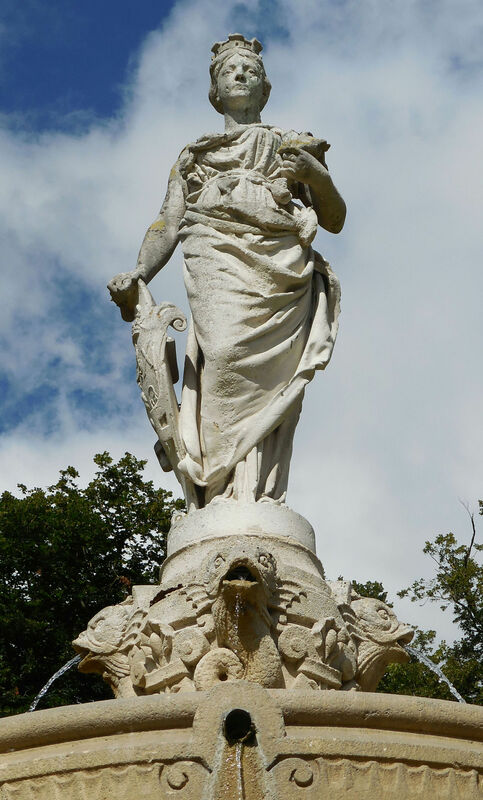 Agnes d’AUMALE died after 1170, married 1st before 1127 Adam I de BRUS (son of Robert I de BRUS and Agnes UNKNOWN) born c1100 in Skelton, North Riding, England, died c1144 in Skelton, North Riding, England, married 2nd c1145 William II de ROUMARE died 1151. 1.1.1.1.3.2.1.3. Enguerrand d’AUMALE married Unknown UNKNOWN.